This recipe for beef brisket is great to have in your back pocket for those times that call for a warming, simple-to-prepare-yet-utterly-delicious dinner. Braised in the oven for a few hours, it needs no looking after, so it’s the perfect meat to cook when you have a million other things going on (oh hello, holiday season!). My family loves to serve thick slices of brisket topped with its cooking accompaniments — onions and garlic — along with garlic mashed potatoes and steamed carrots on the side. I’m dying to try leftovers shredded and set atop potato-leek pancakes or one of these latke recipes (adapted to be gluten-free) as described by Melissa Clark at The New York Times, or, after thickening up its pan juices, in poutine form. Next time, perhaps! If you don’t own a Dutch oven — or don’t feel like fishing it out of the cabinet — feel free to cook the brisket in just about any oven-proof dish. The pictured brisket was just about three pounds, and fit perfectly in a 10″ cast iron skillet. While anything cast iron is my first choice, an 8″x8″ or 9″x13″ glass or ceramic baking dish works, too! Your butcher only have giant slabs of brisket in the meat case? Don’t be shy, ask them to cut you off a more reasonably-sized portion, most will in a heartbeat! Preheat oven to 325°F. 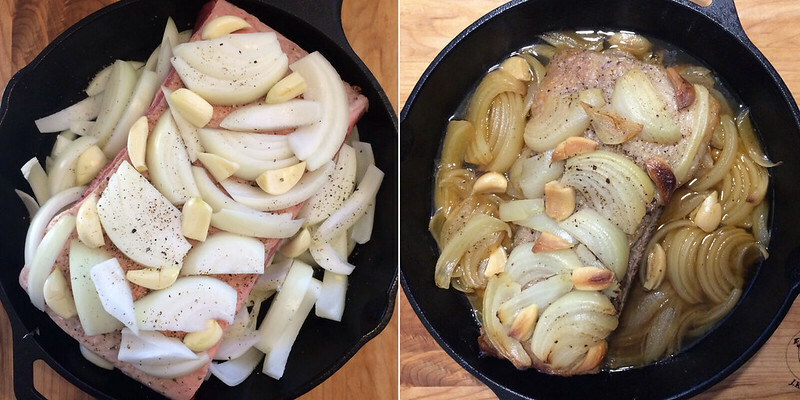 In the bottom of a Dutch oven or 10″ cast iron skillet (or larger, depending on the size of your brisket), arrange about half of the onion slices. Set brisket, fat layer up, atop onions. Top with remaining onions and arrange garlic cloves over top. Season with about 1⁄4 teaspoon Kosher salt and 1⁄8 teaspoon pepper. Cover with a tight-fitting lid or a sheet of nonstick aluminum foil (crimp it well to make a super snug top). Place brisket in the preheated oven and braise for 3 hours or until beef is tender. Allow to rest, covered, for about 15 minutes before cutting slices against the grain.